A proper drainage system of the roof is an integral part of the Pre-Engineered Building Structures. This is mainly to prevent water overflow over the sides through Gutters & properly spaced Downspouts. Basin Spout with ON / OFF. Our " Lotus Collection" is perfect for kitchen, washroom and sink, foam flow taps are designed to complement the contemporary interiordecoration. Add a new dimension to the decor, these elegantlydesigned taps are made of high quality stainless steel and brass thatprovide durability and robustness. 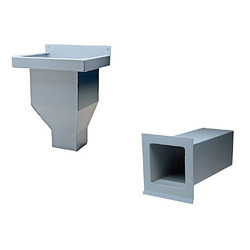 To make to flow water to lower level from gutter and it is available in material of PPGL, PPGI with yield strength from 350-550mpa, thickness from 0.40-0.50mm with spectrum of color. Eave gutters, downspouts, curved eaves, wall flashings and trims are produced from the same material (base metal, thickness, substrate coating, paint finish and color) as the wall panels of the building. Banking on our enriched industry experience, we are able to supply Downspout. Eave gutters, curved eaves, wall flashings and trims are produced from the same material (base metal, thickness, substrate coating, paint finish and color) of wall panels of the building. Ridge panels and roof panel related accessories are produced from the same material of roof panels. We are a unique name in the market to provide our respected customers an exclusive range of Corrugated Downspout.